Seaside resorts are found all over the world, wherever there the water and beaches are nice, the weather warm and the surroundings pleasant. It's no surprise these little pieces of paradise sit on some of the most expensive real estate found anywhere. It's also no surprise their popularity often results in parking problems, especially in Europe, but also in America and elsewhere. The unique situation of seaside resorts calls for special parking solutions to satisfy the needs of everyone. Water makes seaside resorts special. The high demand for and very limited supply of waterfront property drives its value. A single, waterfront residential parking space sells for more than EUR 110’000 in San Sebastián, Spain. Properties on Copenhagen habour front sell for approx. EUR 10’000 /sq.m., and beachfront property in Miami, Florida sells for almost EUR 9’000/sq.m. In addition to land availability and price issues, resort parking has several peculiar characteristics compared to typical urban or suburban car parking. The appeal of many resorts is the ability for visitors to walk everywhere…to the shore, marinas, stores, restaurants, parks, etc. While visitors may not need their cars for hours, days or weeks, they still want them to be easily accessible while parked. Sufficient off-street parking is also needed to prevent traffic jams on usually limited resort roads caused by minimizing drivers circling in search of parking spaces. The issue is how to provide sufficient short-term and long-term parking in the right places. 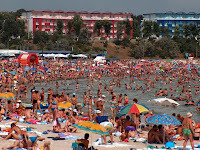 In addition to visitors, criminals are attracted to resorts and tourist locations of all types. Fun-seeking visitors are unfamiliar with the area, less vigilant (more distracted) than usual, carry extra cash and keep valuables on themselves, in their hotel rooms and in their cars. Short and long-term car parking at resorts must provide for the personal safety of visitors and security for their cars. The large number and transient nature of visitors to resorts make safety and security more difficult. The issue is how to provide convenient, secure and affordable parking and occupy as little super-expensive land as possible. Invite us to visit your resort area to discuss all the opportunities for adding parking there.